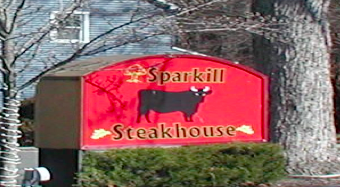 I have been wanting to do more reviews in the southern part of the county and I have been seeing commercials lately for the Sparkill Steakhouse and that was all the invitation I needed. As long time readers will know I am not much of a steak eater but I was sure they’d have something else I would like. For long-time residents you will know that it is at the location of the former Tony’s Lobster House where they had the largest white ash in the nation. Both are gone now and this place stands guard of the corner. Before I go any further I must say that it is definitely an upscale place with a meeting room on the ground level, then a main dining floor, and a banquet hall for about 100 on the top floor. Upon entry I was greeted by the owner, Carlo, and my waiter Dino, both of whom were very friendly and willing to chat. I was shown to my window table overlooking route 340 and I had the opportunity to chat further with Dino and learned that both he and the owner were from Albania. We began talking about that and found that he spoke several languages, including German, which gave me the nowadays rare chance to practice a bit. So as I had perused their lunch menu I decided to have my usual seltzer with lemon wedge and began with their house salad with bleu cheese atop, followed by their steak sandwich. My drink and some bread were brought to me and before that was gone my salad arrived. As I nibbled and chatted with Dino we enjoyed a verbal tour of central Europe which I enjoyed exchanging. I must say that the salad was very generous, almost mountainous with a vinaigrette dressing which I leisurely savored. Upon finishing that my sandwich arrived which again was generously proportioned. The stack of fries was nicely high and the sandwich was well done as I like and here is the best part; it was not the steak as we are accustomed to in a Philly cheese steak which is sliced, it was an actual steak of about 1/3 inch thick with sautéed onions on a large hard roll. I was brought a bottle of their proprietary steak sauce which went perfectly on both the sandwich and potatoes. As I told Dino, it was by far the best steak sandwich I had ever had! As for the place itself, spacious is not the word for it and it was Xanadu clean and organized. The entire meal came to $32.99 and was well worth it. So by all means go and try it and tell them I sent you!